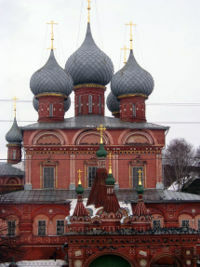 An onion dome (Russian: луковичная глава, lúkovichnaya glava) is a type of architectural dome usually associated with Russian Orthodox churches. Such a dome is larger in diameter than the drum it is set upon and its height usually exceeds its width. These bulbous structures taper smoothly to a point, and strongly resemble the onion, after which they are named. Other important types of Orthodox cupolas are antique helmet domes (for example, those of the Saint Sophia Cathedral in Novgorod and Assumption Cathedral in Vladimir), Ukrainian pear domes ( Saint Sophia Cathedral in Kiev), and Baroque bud domes ( St. Andrew's Church in Kiev). Art historians disagree when and why onion domes became a typical feature of Russian architecture. Byzantine churches and architecture of Kievan Rus were characterized by broader, flatter domes without a special framework erected above the drum. In contrast to this ancient form, each drum of a Russian church is surmounted by a special structure of metal or timber, which is lined with sheet iron or tiles. The earliest academic researchers of Russian architecture pointed out that Russian icons painted before the Mongol invasion of Rus do not feature churches with onion domes. Furthermore, two highly venerated pre-Mongol churches that have never been rebuilt—the Assumption Cathedral and the Cathedral of St. Demetrius in Vladimir—uniquely display golden helmet domes. Restoration works on several other ancient churches revealed some fragments of former helmet-like domes below newer onion cupolas. Based on these findings, it was concluded that ancient Russian churches were helmet-shaped while onion domes had been introduced considerably later. It was posited that onion domes first appeared during the reign of Ivan the Terrible. 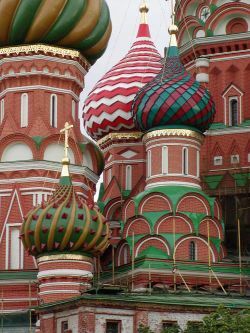 Indeed, the bulbous, wildly coloured domes of Saint Basil's Cathedral have not been altered since the reign of Ivan's son Fyodor I, clearly indicating that onion domes did exist in sixteenth-century Russia. Some scholars even postulated that onion domes were borrowed by Russians from Muslim countries, probably from the Khanate of Kazan, whose conquest Ivan the Terrible commemorated by erecting St. Basil's Cathedral. 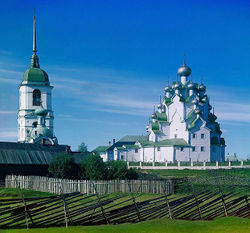 Others argued that onion domes first appeared in wooden architecture of the Russian North, above tent-like churches. According to this theory, onion domes were strictly utilitarian, as they prevented snow from piling on the roof. This theory became firmly entrenched in Soviet architectural theory. Based on the notion that onion domes did not exist in Russia before the mid-sixteenth century, restoration works on churches built before the seventeenth century have routinely involved replacement of onion domes with "more authentic" helmet-shaped domes. 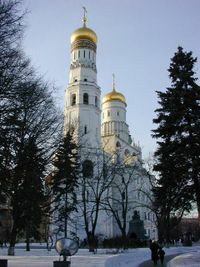 One example of such restoration is the Dormition Cathedral in the Moscow Kremlin. Sergey Zagraevsky, a modern art historian, surveyed hundreds of Russian icons and miniatures, from the eleventh century onward. He concluded that most icons painted after the Mongol invasion of Rus display only onion domes. He found only one icon from the late fifteenth century displaying a dome resembling the helmet instead of an onion. His findings led him to dismiss fragments of helmet domes discovered by restorators beneath modern onion domes as post-Petrine stylisations intended to reproduce the familiar forms of Byzantine cupolas. Zagraevsky also indicated that the oldest depictions of the two Vladimir cathedrals represent them as having onion domes, prior to their replacement by classicizing helmet domes. The domes are often brightly painted: their colours may informally symbolise different aspects of religion. Green, blue, and gold domes are sometimes held to represent the Holy Trinity, the Holy Spirit, and Jesus, respectively. Black ball-shaped domes were once popular in the snowy north of Russia.